Welcome! To the Opening Rush, the NDL blog brought to you straight from the hearts and minds of the NDL pros. 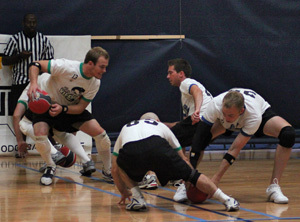 This blog is created to give you an inside look into the sport of dodgeball from our perspective. Every two weeks, this blog will be updated with tips, strategies, and heated debate on the world of dodgeball. I speak for myself, but I believe my fellow Pros can agree when I say that I love dodgeball. As soon as I enter the gym my heart begins to beat a little bit faster. I pick up a ball and the unmistakable smell of rubber reminds me of a time where responsibilities were few, playing was required, and the toughest healthcare decision was trying to choose the Snoopy or Ninja Turtle band-aid. When that whistle blows, the adrenaline rush hits. In the mad sprint to the center line my mind makes a quick decision on if I'm going to win the footrace to one or two balls, if I have to watch out for a pass back, if I can perform my own pass back, if can I pick someone off in their retreat, if I will have to block or dodge an incoming throw, and how many balls each team retrieved, all in about 2.5 seconds. After countless games, I've acquired a Pavlovian satisfaction from hearing the airy ping of rubber rebounding off an opponent, and both participant and spectator alike can feel the shifting momentum when that clutch catch snatches victory from the jaws of defeat. Include the camaraderie of your teammates and the personalities of the different people you meet and...I love dodgeball. As a professional, I am committed to you, the fan and reader, to elevating interest, participation, and spectation of the sport, and improving the quality and culture to produce a fair, exciting, and fun game. Alright, enough of the mushy stuff, let's get on to the action!